Instead of blue plastic, the Blue Oval is made of brushed aluminum to match accents used elsewhere in the cabin. 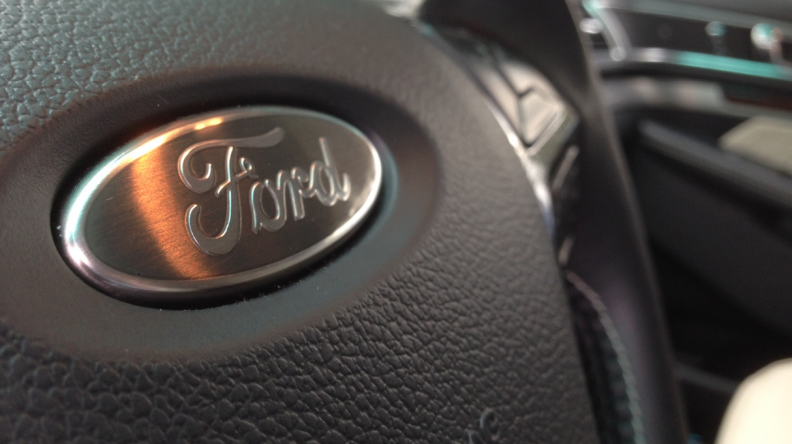 SAN DIEGO, Calif. -- The F-150 isn’t the only Ford Motor Co. icon that’s been changed to aluminum this year. Get behind the wheel of the 2016 Ford Explorer Platinum, which goes on sale in a few months, and you’ll notice that something familiar is missing: the Ford Blue Oval. For the most expensive Explorer series ever, with a starting price of more than $53,000, the company’s logo has gone upscale. Instead of blue plastic, it’s made of brushed aluminum to match accents used elsewhere in the cabin. It’s a change suggested by CEO Mark Fields two years ago, when, as COO at the time, was reviewing a prototype with Michael Arbaugh, the Explorer’s chief interior designer. The 2016 Ford Explorer Platinum will start at more than $53,000. “He asked if I’d ever thought of any other finishes,” Arbaugh said during a media event in southern California this week. Arbaugh immediately referred Fields to the aluminum Ford oval in the Super Chief pickup concept that he worked on in 2007, and he said Fields loved the idea. But there was one more hurdle to cross. Before making such a momentous change, the designers had to run it by the people whose name is on that Blue Oval. Elena Ford, the company’s vice president for global dealer and consumer experience, gave Arbaugh the Ford family’s blessing. And thus the Aluminum Oval was born.